The Lady Indians traveled to the home of the Fannin Lady Rebels on Monday for a non region competition on the high school softball field. With both teams coming in with close to the same records, on paper one would’ve expected a close game. That is what we had heading on to the fourth when the score quickly changed. The top of the first started off well for the Lady Indians. Lead off batter Lea Neumyer laced a line drive to left field reaching first base. This hit was followed up by a Kennedi Henson double to center field that scored Neumyer all the way from first and gave Towns their only run and lead in the game. From that point onward the Lady Indians were held scoreless in the game. Towns out did Fannin 7 to 5 in the hit column but where it counts was in favor of the Lady Rebels. Fannin tied the game briefly in the third and broke open the scoring gates in the bottom half of the fourth. With 10 Lady Rebels stepping to the plate, four batters reached by hit and four reached either by walk or hit by pitch. In this blast of offense Fannin pushed 7 runs across the plate for a big 8-1 lead. The Lady Rebels added a big run on the board in the last half of the fifth inning giving them the 9-1 GHSA mercy rule victory. Entering the circle for the Lady Indians were Abby Mauldin, Kennedi Henson and Natalie Smith. These three ladies combined in throwing 106 pitches and a total of 5 hits and 4 strikeouts. 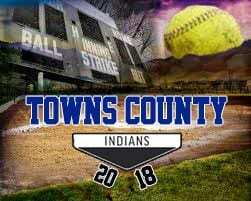 Playing a big factor in the Fannin runs was the 8 walks allowed by Towns Co. pitchers in the game 7 of the 9 runs scored were earned and the Lady Indians defense committed 4 errors in the loss to the Lady Rebels. At the plate Lea Neumyer was 2 for 2 with a walk and a run scored and Kennedi Henson had 2 hits in 3 appearances at the plate with 1 RBI. Three batters had 1 hit each in the game for the Lady Indians. Hebron Christian Academy will make their way to the home of the Lady Indians on Tuesday for a 4:45 PM start time.